With 79% fewer bladder leaks...40% fewer bathroom trips... and a 95% overall satisfaction rating, you'll think you've found the "Holy Grail"
And you are most certainly not alone. The American Urological Association says overactive bladder (OAB) affects up to 40% of women and 30% of men. As many as 1 in 3 adults suffers urinary incontinence. And adults over age 65 are twice as likely to suffer from OAB as those 45 and younger. That's a lot of us racing to the restrooms all day long—dealing with one bladder issue after another. That Could "Last" Another Hour? Too many of us think the only options available are the doctor-recommended solutions that are only marginally effective and prone to side effects, or the embarrassing and uncomfortable disposable underwear products you see advertised every time you turn on the TV. But finally, there's a better and easier alternative. It's an all-natural breakthrough that works so well to revitalize your bladder strength and lasting power, you'll be thrilled to learn about it. So what is this amazing breakthrough discovery? It's a natural "bladder strengthener" that addresses the root cause of the problem to give you the extra control and peace of mind you need to avoid those uncomfortable urgent situations. In one groundbreaking clinical study, participants gave it a 95% satisfaction rating. How often do 95% of people approve of anything these days? With a boost like this, you'll be back in the driver's seat. No stress. No embarrassment. No doctor-recommended solutions and absolutely no absorbent underwear!!! The breakthrough solution I've been talking about is a unique and fascinating combination of nutrients. And scientists are just now beginning to understand their potent benefits for the human bladder. For many people an overactive or leaky bladder is simply a tired bladder. It's common for the bladder sphincter, bladder wall and pelvic muscles to lose their tone with repeated use over many years. As a result, your bladder doesn't empty completely, which puts you well on your way to your next full bladder before you even leave the bathroom. "This Is Ridiculous—I Just Went!" As for bladder leaks, they occur because of the same root cause: weakened bladder and pelvic muscles that would otherwise help you hold it in. When these tiring muscles face a sudden involuntary pressure like a laugh, sneeze, cough or even just lifting a box, they can't hold down the fort. Bladder leak here we come, with another embarrassing moment that could end up ruining your entire day. But the good news is that now, strengthening these muscles and restoring your bladder's lasting power is easier than you ever imagined. It's completely safe, too, and without side effects, because this extraordinarily effective bladder control solution comes from two of nature's most potent and healthy foods: pumpkin seed and soy. Pumpkin seed has been used for centuries by traditional healers to promote urinary health. The same goes for soy, which is one of the world's oldest foods, cultivated in Asia as far back as 9,000 years ago. However, the breakthrough solution I'm introducing to you today doesn't rely on the typical, generic pumpkin seed or soy germ extracts that are widely available in the supplements sold in grocery and discount stores. The specific, clinically studied forms of these two nutrients have been taking the world of urinary health by storm since scientists in Switzerland were able to identify their most active compounds from each of these nutrients that have the greatest impact on bladder performance. And just as importantly, they developed the patented HyperPure extraction process that concentrates these compounds to much more effective therapeutic levels. I'm simply amazed by the research backing the effectiveness of EFLA®940, a patented lipid-free pumpkin seed extract—the key to its unique potency and activity. It contains the complete spectrum of pumpkin seed's active constituents but without the lipid fats that can oxidize and significantly reduce pumpkin seed's remarkable health benefits. Studies indicate EFLA®940 binds with androgen receptors located in the muscles of the urinary tract and pelvic floor. When these receptors are activated, it has a direct anabolic effect on the muscle tissue itself. SoyLife® is a GMO-free, advanced soy extract—the first soy germ extract to earn patent protection for its unique blend of isoflavones and other healthy phytonutrients. Soy isoflavones help balance hormones in the body, and research indicates these natural phytoestrogens can improve the elasticity of the urethral wall in women who suffer bladder control issues. But here's what most people don't know—men benefit big-time from soy isoflavones, too! Recent research testing a 400 mg daily serving showed how soy isoflavones significantly improved the full range of urinary symptoms among men, including frequency, intermittency, urgency, incomplete emptying, weak stream and straining. And when scientists combined the EFLA®940 and SoyLife® into one proprietary formula and tested it, the results were off the charts. User Satisfaction Was the Highest I've Ever Seen! I can say with no exaggeration, the results from multiple gold-standard studies on EFLA®940 and SoyLife® have produced the highest level of consistent participant satisfaction that I've seen in the two decades I've been reviewing clinical research. 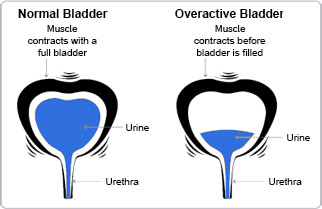 One 12-week study published in 2014 involved women aged 35 to 70 who suffered the symptoms of overactive bladder. At the end of the trial, 95% of the study participants who received this two-nutrient combination were so satisfied that they wanted to continue taking it. They didn't want the study to end! That's how much it changed their lives. It's easy to see why. This unique combination reduced their urination frequency by nearly 30% and urinary urgency by more than 30%—and that includes results for both daytime and nighttime. Those Were the Gratifying Results for Women. The results in a separate study of men over age 65 were also quite amazing. In this trial of the combination of EFLA®940 and SoyLife®, participants began feeling results in less than a week. 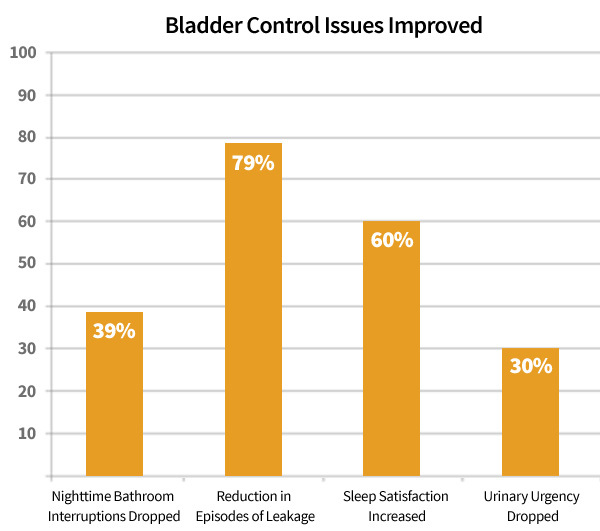 After six weeks, a full 87% rated themselves as "significantly improved" or "improved" when it came to nocturia (frequent nighttime urination). That's because they enjoyed a 40% reduction in nighttime bathroom visits on average. Needless to say, their sleep satisfaction rose as their nightly interruptions dropped. And additional clinical trials produced great results for the two most frustrating symptoms of all—bladder leaks and urinary urgency. After Six Weeks, They Were Barely a Bother! A third study of postmenopausal women put urinary incontinence to the test and the results were just as dramatic. The women with the highest frequency of bladder leaks enjoyed results that were nothing short of outstanding with a 79% reduction in episodes of leakage! Among all women, nighttime bathroom visits dropped an impressive 39% after just six weeks—an average of 1.3 fewer interruptions every night. That means if you're one of the millions of people who have to go twice every night, you'd only have to get up once. And sometimes, not at all! As for participant ratings, sleep satisfaction among the participants in this study nearly quadrupled in six weeks, skyrocketing from 16% to 60%. No wonder they were so thrilled! And when it comes to urinary urgency, this extremely effective combination passed the test with flying colors once again. For many people, reducing these episodes is hands-down the very best part of bladder relief. Up to Two Extra Hours of Bladder Comfort! That's the ballpark average when you reduce your daily urgent episodes by over 30%—enough extra "cushion time" to enhance your activity options for the entire day. You can now achieve greater urinary comfort...less urgency...fewer trips to the bathroom...and fewer bladder leaks—easily, quickly and naturally. You just need the right daily support! Look around at drug stores or online and you'll find many bladder support supplements on the market today. And some of them contain pumpkin seed and soy. But don't get fooled by this. Most utilize the generic forms and small amounts of these nutrients and won't provide the level of benefits (if any at all) seen in the clinical research results I've described above. 1. Be sure it includes full research doses of at least 600 mg of EFLA®940 and SoyLife®. The clinical studies show how these advanced forms stand out from ordinary pumpkin seed and soy germ extracts. They provide superior results due to their greater potency and stability. You should get at least a combined 600 mg of these well-researched ingredients in every daily serving for best results. 2. Look for targeted probiotic support. In the last few years, science has taught us a ton about the many health benefits of probiotics, but you might not be aware of their positive impact on bladder health. Most modern, cutting-edge bladder support supplements take advantage of the latest science and include probiotics in the formula. You see, keeping your bladder and entire urinary tract free from harmful bacteria helps your bladder perform at its best day in and day out—and targeted probiotics will help you achieve this. Studies show that certain probiotic strains, like L. rhamnosus, effectively adhere to urinary epithelial cells and block the adhesion of pathogens which can make urinary and bladder issues much worse. So a complete bladder control formula should absolutely include this targeted probiotic strain. I always urge my readers to do their own research to find the best solution for their needs. And many of them have told me that they were having trouble finding an effective bladder control supplement at an affordable price. So I set out to solve this problem. You see, in addition to my work with Live in the Now, I also run Stop Aging Now, a company that has been making premium-quality supplements for over 20 years. After reviewing the groundbreaking research on EFLA®940 and SoyLife®, I went to work with Stop Aging Now's Scientific Advisory Board to formulate a superior bladder control formula. Our goal was to combine EFLA®940 and SoyLife® into a convenient supplement that almost anyone can afford, because no one should suffer needlessly with life-disrupting bladder issues. It's called BladderControl360™, and right now you can get it for as low as $17.95 per bottle containing a full month's supply, and enjoy free shipping and a one year guarantee. 1. BladderControl360 provides a full 625 mg of EFLA®940 and GMO-free SoyLife® combined in every daily serving of two easy-to-swallow capsules. That's the exact amount used in studies I described earlier that have produced such excellent results. You get state-of-the-art ingredients at therapeutically-tested levels. 2. BladderControl360 includes 5 billion CFU of L. rhamnosus. This probiotic is clinically shown to be effective for urinary system protection against bacterial issues. What's more, 5 billion CFU is a true therapeutic dosage—up to 10 times more L. rhamnosus than you get in typical multi-strain probiotic formulas. And most bladder control supplements don't contain any probiotics at all! 3. State-of-the-Art Quality. BladderControl360 is made in Stop Aging Now's own FDA-inspected facility in Florida under the most stringent quality control processes. This ensures 100% purity and potency with every capsule. 4. It's Affordable, Ships for Free and Is Risk Free. 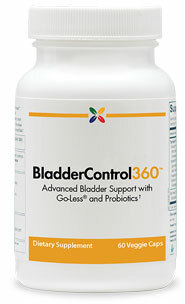 BladderControl360 is amazingly affordable at as low as $17.95 per bottle, containing a full month's supply. That's a small price to pay for this premium-quality formula that can provide such remarkably effective help for the frustrating issues caused by an overactive bladder. It's not available in stores, but it ships for free, and you can try it without risk with our industry-leading 365-day guarantee. and It Can Work for You, Too! I know firsthand how frustrating bladder issues can be. They can feel overwhelming and significantly reduce your quality of life. I saw it happen to my 88-year-old father and it broke my heart. But after taking BladderControl360 for several weeks, he's raving about this product. He's now able to take longer drives, sit through movies and sporting events, and spend active time with his grandchildren without the anxiety he was clearly feeling just a month ago. I'm firmly convinced you'll be thrilled with BladderControl360—just like the 95% of study participants who gave its ingredients a hearty thumbs-up. But I know you've heard promises like this before. That's why BladderControl360 is backed by our industry-leading 365-day guarantee. If you are not satisfied for any reason, I'll gladly send you a full refund of every penny you paid—up to one year after purchase. Imagine the feeling when you realize that you once had to endure all the frustrations of an overactive bladder...and now you don't—thanks to this simple new formula. Why not see for yourself with this risk-free offer! 4. Shim B et al. A randomized double-blind, placebo-controlled clinical trial of a product containing pumpkin seed extract and soy germ extract to improve overactive bladder-related voiding dysfunction and quality of life. J Funct Food 2014;8C:111-7. 5. Terado T et al. Clinical study of mixed processed foods containing pumpkin seed extract and soybean germ extract on pollakiuria in night in elderly men. Jap J Med Pharm Sci 2004;52(4):551-61. 6. Yanagisawa, EI et al. (2003). Study of effectiveness of mixed processed food containing cucurbita pepo seed extract and soybean seed extract on stress urinary incontinence in women. Japanese Journal of Medicine and Pharmaceutical Science 14;3:313-322. 7. Sogabe H and Terado T. (2001). Open Clinical Study of Effects of Pumpkin Seed Extract/ Soybean Germ Extract Mixture containing Processed Food on Nocturia. Jpn J Med Pharm Sci. Nov;46(5):727-37. 8. Xi Zheng et al. Soy Isoflavones and Osteoporotic Bone Loss: A Review with an Emphasis on Modulation of Bone Remodeling. J Med Food. 2016 Jan 1;19(1): 1-14. 9. Douglas CC et al. Soy and its isoflavones: the truth behind the science in breast cancer. Anticancer Agents Med Chem. 2013 Oct;13(8):1178-87. 10. Damiano R et al. The role of Cucurbita pepo in the management of patients affected by lower urinary tract symptoms due to benign prostatic hyperplasia: A narrative review. Arch Ital Urol Androl. 2016 Jul 4;88(2):136-43. 11. Reid G and AW Bruce. Selection of Lactobacillus strains for urogenital probiotic applications. J Infect Dis 2001;183(Suppl 1):S77-80. 13. Segers ME and Lebeer S. Towards a better understanding of Lactobacillus rhamnosus GG-host interactions. Microb Cell Fact. 2014;13(Suppl 1): S7. 18. Woong JB et al. The Effect of Seoritae Extract in Men with Mild to Moderate Lower Urinary Tract Symptoms Suggestive of Benign Prostatic Hyperplasia. Evid Based Complement Alternat Med. 2016; 2016:1960926.